Visited this restaurant regularly for drinks and snacks, also had lunch and an evening meal here-every time the service was first class and the food good value for money. Visited here a few times on a recent trip to Leiwen. Prices were good for the location which is on a terrace overlooking the river. 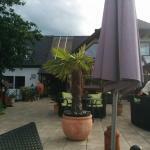 Been to Cafe & Wirtshaus Panorama? Share your experiences!